Jet Set Smart: SAFELY HOME! Hey Jet Setters, I'm back! I was in Korea and Japan for the last two weeks and have to say that Asia was amazing! I can't wait to share pictures and stories with you all very soon. First, I want to tell you about the crazy flight experience I had leaving the U.S... On Sunday, May 9th, I boarded Continental Flight #9 from Newark International Airport for a 14 hour flight en route to Narita International Airport in Japan. Shortly after take-off I heard a loud boom and then the plane started to shake, and it felt like the plane wasn't climbing like it should have been. Next thing I know, the captain makes an announcement saying "Ladies and Gentlemen, we have a problem with our hydraulic system...it's not working, and so the back-up system has kicked in, but we will have to land again, but before we do, we must circle first to dump fuel." Well, we circled for about 45 minutes, dumping 170,000 gallons of fuel (I later found out). People were throwing up all around me, flight attendants were running up and down the aisles...it was scary!!! Right before we landed one of the flight attendants made an announcement saying "Ladies and Gentlemen, we will be landing shortly, please be advised that our landing will be harder and faster than normal." And it was! We hit the ground pretty hard, and the plane swerved right and then left (from all of the fuel still inside). There were emergency vehicles waiting on the runway for us (just in case), and they escorted us back to the gate. We all got off of the plane (shaken and confused as to what happened), and were handed food vouchers to go eat while they determined what would happen. 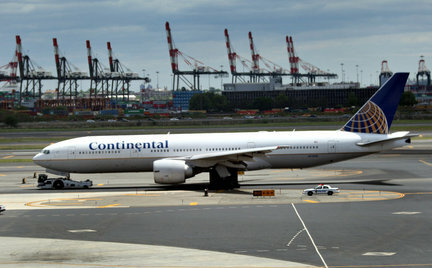 Continental decided to give us a new plane, and we finally left for Japan that night at 8:30pm! We all later found out that part of the wheel broke off during take-off, and so the landing gear couldn't go back into position after take-off (hence why the plane couldn't climb and why it was so shaky). We also later found out that what had happened to us on that flight made the news!!! Yes, it was on CNN and all of the local news channels! Click here to read about it. I have to say in all of my years of jet setting, this was the first time something like this has ever happened to me. It's nice to be back home safely! WOW! That's insane. I've been through some rough flights and landings but never anything has harrowing as your experience. So glad that you made it to Asia and back safely! Looking forward to your report.